Decisions to build statues are mostly dictated by political expediencies, resulting in violation of law and more importantly, negation of urban planning and the ecology. India has been a land of great men and women. While it was common for the contribution and valor of these honorable individuals to be lauded in the form of printing commemorative stamps, coins, bestowing of awards etc; the recent trend of felicitation, which has resurfaced in India today, is installing statues in the honor of a dignitary. It started with the inauguration of the Statue of Unity (in the memory of Sardar Vallabh Bhai Patel, India's 1st Deputy Prime Minister) which is currently the tallest statue in the world, followed by the Shiv Smarak in Maharashtra and the spree of statues announced by Uttar Pradesh Chief Minister Shri Yogi Adityanath. 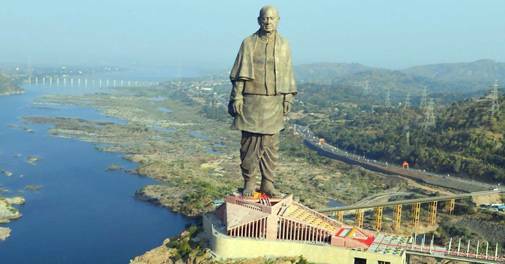 While a lot has been written about the huge expenditure incurred in construction of such large scale statues (Statue of Unity was built at a cost of approximately Rs. 3,000 crores), very little attention has been given to the entire genesis of the decision behind erecting these statutes. There exist both statutory law and judicial decisions, which stipulate a detailed procedure before any statue can be installed or constructed in India. In the present post, I discuss the said procedure. This post shall cover the questions of, who approves the decision to install a statue; the permissions and approvals required and where can a statue be installed. A special discussion on the Statue of Unity and the legal violations involved in its construction shall also be undertaken. As discussed in a previous post, the Seventh Schedule of the Constitution of India demarcates the subject matter on which the Parliament and the State Legislature can make laws respectively. Entry 18 of the State List, mentions 'land' , thereby empowering only the state government to make laws on aspects concerning the same, including constructions on the said land. This observation has been consistently upheld by the Courts, as they have termed the state government as the 'owner' of all public lands in their territory. B. Installing a Statue: Who decides? Since state governments are empowered to make laws regarding construction on lands (which includes installation of statues) in their territory; every state has passed different laws. The common thread however, is that a decision to install a statue requires a mandatory approval of the District Administration followed by the state government's approval (i.e. state cabinet). In fact, the decision of the state government in this regard, is given top priority. i. Step One: A request is made to the District Administration/State government for installing a statue by a citizen of India. ii. Step Two: Once the request is approved by the state government, the proposal is forwarded to Municipal Corporations/Urban Development, Authorities/Panchayats, Electricity Authorities, Water Authorities, and other necessary authorities, for a clearance certificate. iii. Step Three: Once a clearance certificate is issued by the above bodies, one can proceed with installing the statue. C.	Where can a Statue be installed? The location of a statue has always been significant. For instance, the Statue of Unity was installed near the Sardar Sarovar Dam; Lord Ram's statue is being installed on his alleged birth site etc. Interestingly however, the governments do not have an unbridled power to decide where to install a statue, as there exist mandatory regulations which are to be taken into account, while deciding the location. As a general principle, the law grants the citizens a right to install statues in their private property. The only caveat is that the citizen should ensure the protection of the statue and not cause a law and order problem. This general rule does not apply in Maharashtra by virtue of a notification issued in 2017 by the General Administration Department. As per the notification, for installing a statue even in a private land, a no-objection certificate from the police station guaranteeing that the statue will not create a law and order issue or a communal tension in future, is mandatory. An additional requirement of local residents not opposing the statue also needs to be met, even by private individuals. However, these rules are only applicable in Maharashtra and not to other parts of India. As discussed before, 'land' is considered to be owned by the state government. With this ownership also comes the responsibility of using it with the best interests. Courts have consistently held that such land amounts to public property and should be used for the welfare and betterment of the public. The above position has been seconded by the Supreme Court of India in its order in Union of India v. State of Gujarat wherein it mandated the state governments to not grant permissions to install/construct statues in public roads, pavements, sideways or other public utility places. This decision has been strongly enforced by the Courts and permission to install statues of leaders like Mahatma Gandhi, Shri Birsa Munda etc. have been refused, when proposed on a public utility place. Therefore, the position of law is that a decision to install a statue rests with the state government subject to obtaining necessary clearances. However, the said statue cannot be installed in places of public utility namely highways, roads etc. As long as the above is fulfilled, the Courts adopt a policy of non-interference and allow wide discretion to the government to decide who's statue to be installed and where. The Statue of Unity is not a 'mere statue' but a project with large scale implications. Never before has the country undertaken such a mammoth construction. That being said, given the nature of the project, it also brought with it various environmental concerns, namely, the project's location near a protected wildlife sanctuary, acquisition of indigenous land, transferring of endangered species etc. Generally, the law on installing a statue is limited to what is discussed above; however, when the statue is part of such a large project and has large scale environmental ramifications, compliance with environmental laws becomes a must as well. Sadly, the Statue of Unity falls flat on such compliances. Pursuant to a notification issued by the Ministry of Environment (Notification), every major construction taking place within 10 km of protected area notified under the Wild Life Protection Act, 1972 is considered as a Category A project, requiring a mandatory Environment Impact Assessment Report (Report). The Statue of Unity, is 3.2 km away from the Shoolpaneshwar Wildlife Sanctuary, which is a protected area under the Act, thereby making an Environment Impact Assessment Report a must, before the construction commenced. However, as per reports, no such report has been obtained and approved till date. Second, the possibility of the Report's approval also seems bleak given the nature of the Statue. As per the Notification factors like (a) whether the area is used by protected species of flora and fauna? ; (b) whether the area is important for ecological reasons? etc. play a significant role, while deciding the question of environmental clearance. The Statue of Unity answers the above questions in affirmative as the site is home to mugger crocodiles, which are notified endangered species and have been transferred due to the construction. Additionally, for approval of the Report, a public consultation is mandatory so as to consider objections to the said construction. However, no such consultation was called in by the government, as per media reports. The Statue of Unity, apart from violating the statutory law, also goes against the decisions of the Courts. The Courts have time and again cautioned the government against constructions that negatively affect ecological balance and even warned judicial interference if the above is not followed. Similarly, for the Statue of Unity, water bodies are being diverted and flora and fauna is being removed. In this apparent attempt to honour a leader, the ecology is suffering. The decision of the High Court although not binding on the state of Gujarat, does carry a persuasive value and a call to preserve the environment. While the Courts have always considered the government authorities as the trustee of the environment, it seems that this feeling is not respected. As of today, the Uttar Pradesh government has planned to install several other statues throughout the state, which shall carry a heavy burden on the exchequer. The rise of statue politics in India, reminds me of the words Justice Jagdeesan in K Kannadasan v. District Collector, wherein he cautioned against using statues as a medium to respect our heroes. However, it seems today, that statues of national leaders are made an excuse to divert public land from more pressing utilities. Sadly, decisions to build statues are mostly dictated by political expediencies than sound policies, resulting in violation of law, and more importantly, negation of urban planning and the ecology. The devil certainly lies in the details; however despite elaborate procedure existing in place, the installation of statutes has been made to seem far more innocuous and common place, than it ought to be. One can therefore only hope for a day in the near future, when an announcement is based on rational reasoning, corroborating the need for the same instead of it being used only as a tool for political appeasement.